smartELEVATOR Lift Control System is designed to be used in lifts for the protection of your valuable assets. The system is compatible with different types of card readers, e.g., Mifare, HID, EM, etc. The system has built-in controller for ON/OFF line operation, to prevent interruption of service in case of workstation failure, and for fast and accurate user authentication. Moreover, the system is embedded with RS485 or TCP/IP (external converter) connections for remote access via Internet. 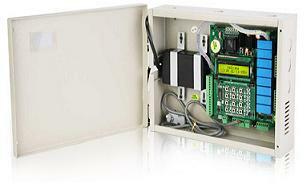 Controls upto 32 floors (Ground Floor + 32 floors) using relay mechanism. Card / Fingerprint readers with Wiegand o/p is mounted inside the lifts / Car Panel. Users are added by using keypad on the controller or through Software. In case of card reader Users & Floor patterns can be added by using Keypad Menu or Software Utility. Single User can access multiple floors depending on the rights given against the User Id during enrollment. Maximum user limit is 1500 using card reader & 5000 event buffers. All cards have access to ground floor.